10 Highly Effective Home Cures! Home » Recipes » 10 Highly Effective Home Cures! You can easily avoid going to the drug store when dealing with aches, pains, coughs, cuts and burns by simply using plants, herbs and foods you already have at home. When it comes to using home remedies, it isn’t their convenience that matters the most, but the possibility to heal your body safely and completely naturally. Ginger has proved extremely efficient in improving symptoms of nausea and vomiting by five-fold. As it does wonders for an upset stomach, piking at a piece of fresh ginger root is highly recommended in case you’re feeling sick. Another thing you can do is dip fresh ginger in hot water and drink it as tea. (Note that ginger freezes well, so keeping a piece in your freezer for any necessity is a good idea). Minor burns can easily be treated by soaking a washcloth in cold tea and applying it to the affected area due to the fact that tea is abundant in phytonutrients and antioxidants. You can also lessen eye puffiness by applying cold tea bags on your eyes (and, according to Dr. Oz, warm peppermint tea bags are beneficial for itchy eyes). Apart from being an attractive exotic houseplant, an aloe plant is also abounding in healing properties. As aloe gel is anti-inflammatory you can easily use it on a sunburned skin – break off a piece and apply the fresh gel on the sunburnfor immediate relief. It is even believed that it minimizes the appearance of wrinkles and irritations such as acne. Similar to aloe plant, honey (especially raw honey) is abundant in healing properties. It is highly antibacterial and has live enzymes which reduce cough frequency and severity, as well as improve the quality of sleep (which would otherwise be interrupted by coughing). It can also accelerate wound healing and relieve minor skin irritations and blemishes. Tea made of pomegranate skin dipped in boiling water is helpful for calming a queasy stomach and relieving diarrhea. You can actually keep the dried skin for about six months and it will still be efficient. Director of the National Institute of Whole Health, Georgianna Donadio, PhD, recommends consuming a few slices of burned toast and black tea to relieve the symptoms of food poisoning faster because of the toxicant-neutralizing tannic acid and charcoal they contain. 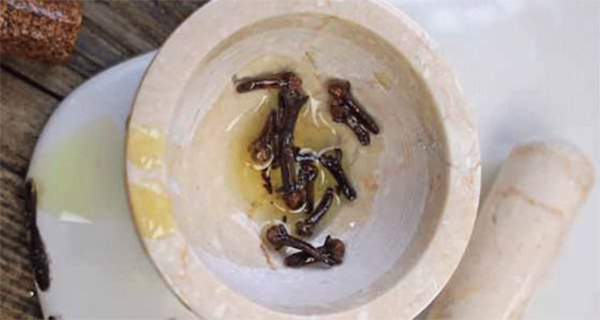 What makes cloves ideal for oral care is their antiseptic and mild anesthetic properties. Steeping 10 dried cloves in half a cup of water for 10 minutes makes an excellent antimicrobial mouth rinse. Removing the cloves swish the water in your mouth for pain relief and to kill bacteria. Another thing you can do is apply clove essential oil directly onto a toothache with a cotton swab. A clove of fresh garlic a day will keep your cholesterol levels healthy (but keep in mind to chop it first so as it releases its active ingredient). Dr. Oz reported for the National Health and Medical Research Council that this simple trick may reduce your cholesterol by almost 10 percent. Tart cherry juice is mainly appreciated for its pain-relieving effects in arthritis and joint pain, but also in sore muscles. As this juice reduces the main indicators of inflammation, such as C-reactive protein (CRP), it can virtually be used to ease any type of inflammatory pain. This post was republished from healthyfoodteam.com. You can find the original post here.